Henry Fenton owned the Bandy Canyon Ranch in the San Pasqual Valley from the early 1900s until his death in 1952 at the age of 80. He left behind an unfinished memoir, which was incorporated into Henry Fenton: Typical American, a book written and privately published by his granddaughter, Laura Fenton, in 1952 and now in the public domain. Fenton was only eight years old and living in Iowa when his schoolteacher father’s sudden death forced his mother to send her young son to family members in California for support. 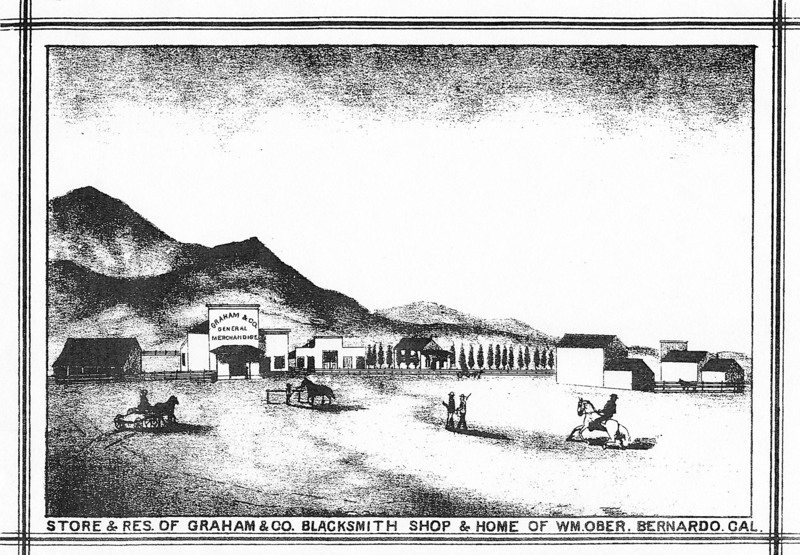 He arrived in the San Pasqual Valley in 1879 and was immediately put to work as a farmhand on the San Pasqual Valley ranch owned by his uncle, William Thompson. Young Henry would eventually own that ranch, but that’s a story in itself. For now, a brief anecdote from his memoir offers a snapshot of a day on the farm and young Henry’s interaction with the blacksmith in the nearby farm town of Bernardo. Fenton arrived on the farm on July 18, 1879, and his first task was to help another young farmhand “bring a mule to the blacksmith for shoeing.” His companion, also a boy, “was trying to lead the mule on horseback,” recalled Fenton, “but the mule wouldn’t lead. The old man [Fenton’s uncle, William Thompson] told me to take a switch and start the mule away from the barn.” Fenton wound up walking along with the mule and rider several miles down to the blacksmith shop in Bernardo. You wouldn’t think the size of his hunk of cheese would have been the first thing he was thinking of, but hey, I guess it was a different time. Sources for this post included the Fenton book, historic San Diego newspapers, and The Grapevine, newsletter of the Escondido History Center. 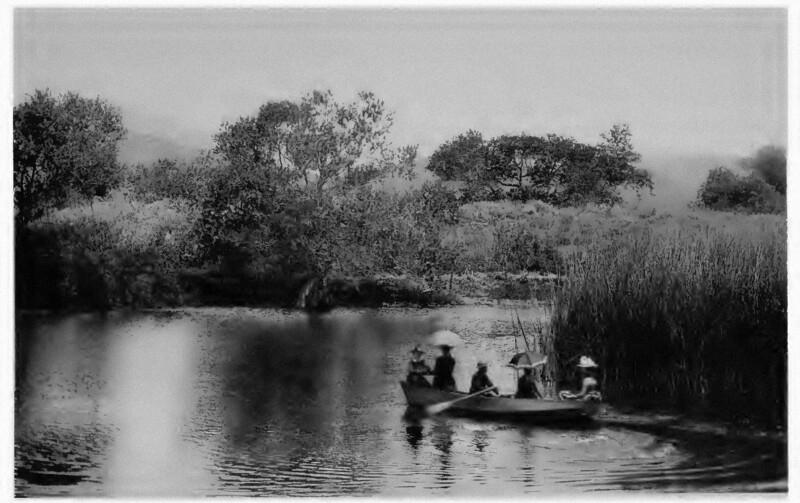 View of Lindo Lake in 1887 from the book, Picturesque San Diego. “The New Town of Lakeside” was the headline of a short item on page 3 of the San Diego Union on May 12, 1886. The “neat hotel” referred to was the Lakeside Inn. The inn and Lindo Lake would make the new town a destination for tourists as well as permanent residents. The book Illustrated History of Southern California, published in 1890, noted that the El Cajon Valley “has long been the largest wheat-producing valley in the county, owing to the exceptionally fine crops yielded in good years and its accessibility to market and export.” In addition to improved surface roads, the railroad had come through with a stop at nearby Foster. And that was just as of 1890! Sources for this post included historic San Diego newspapers, the books Picturesque San Diego, and Illustrated History of Southern California, and the website of the Lakeside Historical Society, http://www.lakesidehistory.org/ . From “Avocado Cocktail” to the desserts of cake and “Ice Cream a la Carlsbad,” all the items were “composed of avocados prepared by Carlsbad ladies, under supervision of Sam Thompson, Chef.” Thompson was one of the original cultivators of avocados in Carlsbad, planting the first groves there in 1916. Avocado Day would become a regular October event in Carlsbad until the eve of World War II, and avocados would be a major crop in the city until the late 1940s. Then a postwar building boom made it more lucrative to sell the groves for housing rather than for their fruit. But some growers still found crops that proved commercially viable enough to keep working the land. Prominent among them was Luther Gage, a Montebello nurseryman who planted gladioli, freesias, ranunculi and anemones on five acres at Tamarack and Jefferson. This marked Carlsbad’s transition from avocado fields to flower fields. Sources for this post included historic San Diego County newspapers and the 1994 book, Carlsbad: The Village by the Sea, written by Charles Wesley Orton for the Carlsbad Historical Society. “About 1,500 people attended the Farmers’ Alliance and People’s party Fourth of July celebration and picnic at Turrentine springs, west of town, coming from many miles around,” proclaimed the Escondido Times on July 5, 1894. The one-paragraph article gave the names of the principal speakers and said they all “made speeches from the standpoint of Populist doctrine.” The proceeds of the picnic would go to the Populist campaign fund and “the lemonade and ice cream stand did a big business.” And that was the extent of its coverage. That the nation was then in an economic depression was very much on the minds of everyone there, the article reported.